I am delighted to welcome Steven Hayward on my blog today. There are two books in the series so far Mickey Take and Jammed Up but Steven is working on a third book, so very exciting times ahead for an already growing following. There are some pretty dark characters in the series which will chill you on the warmest of Summer nights! If you haven’t done already take a look at Steven’s books you wont be disappointed. Writing is something that has burned within me since I was a child. I always had my head in a book – even in the summer holidays, Mum would have to shoo me out into the garden to get some fresh air! And at school, I loved English, and in particular writing stories. I can still remember some of them now. Growing up on the coast in Dorset, I became the black sheep of a close, working-class family by passing for grammar school. It was there that common sense dictated I should study Economics. Although I wasn’t particularly good at writing factual essays (especially under exam conditions), something about the idea of a science that was all to do with human nature rather than photosynthesis, Bunsen burners and resistors caught my imagination. Ironically, it was to be the only exam I failed (whilst excelling in English and Art), but when it came to thinking about the future, the outcome of a single job application was to determine between a return to my creative preferences at A level, or a career that would take me further from them. Suffice to say I got the job and joined a bank, and broke the family mould again when I moved to London at the age of 22. I met my wife Helen and we’ve been married for 25 years. I travelled quite a lot for various banks, living and working in a few different places, ending up as the Head of Anti-Financial Crime at a US bank in Canary Wharf. I’ve run the London Marathon twice and, as the financial controller of its annual advent ball, helped to raise over half a million pounds for New Ways (www.newways.org.uk) a charity achieving incredible results in the remotest parts of Africa. Eleven years ago, after almost 25 years in finance, I took the opportunity for a sabbatical and, as well as raising a beagle puppy (my muse, Ella), I went back to explore those right-brain preferences. Three years later, I quit the full-time job with the long-term aim of becoming a published author. By the time I sat down to write my debut thriller, Mickey Take, I had attended several creative writing courses. At one of them I was given a single use camera to write about, and that started the idea of what I would do if I found one in suspicious circumstances, partly-exposed. Would I get it developed and what might be revealed? Another influence on the style of the book was a novel I was reading at the time called Contract by graphic novelist Simon Spurrier, which gave me the confidence to tell the story in the present tense and through the eyes of an unreliable and slightly confrontational narrator. After a lot of writing, re-writing and editing, Mickey Take was ready, but a contracting opportunity took me back to the City for a year, which to be honest, probably saved me from my fair share of agent/publisher rejection letters! 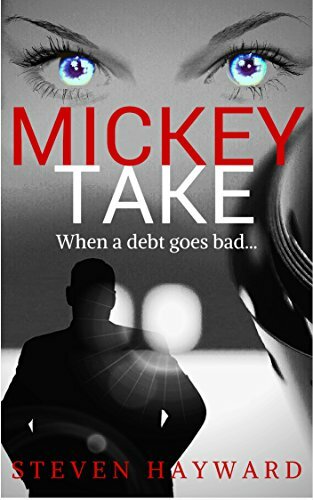 Back with my author hat on, I re-wrote the ending and reached out to an editor I’d met a couple of years before, and finally Mickey Take was self-published in October 2014. Since then I’ve continued to divide my time between writing crime fiction and consulting for banks on their anti-money laundering controls. Most recently, after another year of work, I wrote the prequel/introductory novella, Jammed Up, which was published in May 2016. Although it’s set against the same backdrop a few years before Mickey Take, I had great fun introducing some new and colourful characters into the mix. And now, before venturing again into the real world of financial crime prevention, I plan to complete and publish the third book in the Debt Goes Bad series in early 2017. What a brilliant find Steven Hayward has been,this is his debut novel and a little bit off track to my normal gendre but he can certainly tell one hell of a story. The first chapter sets the scene back in 1983 which will change so many lives. It is here where you are introduced to The Watcher, who will raise the little hairs on the back of your neck more than once. The story on the whole is told in the first person narrative through Michael Field an ex banker doing a favour for an old friend and paying a debt off from years before. Nothing is ever simple though and this story is certainly an iceberg with the main bulk of it sitting beneath the surface. There are some pretty dodgy characters in this book of gangsters, revenge and dodgy dealings, but what I loved the most was how Steven Hayward would set a scene and let my imagination run wild with what had happened there. Boy did I scare myself. Excellent reading and book Two is just round the corner. Mint! What a little Gem this book is. I loved the first novel, Mickey Take, and Steven Hayward has stepped up to the plate and hit a home run with this novella too. Some of the characters were in the last book so I dropped into the story very easily. The more I have read about Herb the more he has grown on me, I am becoming quite fond of him, but Mac continues to frighten the living daylights out of me. Each novel has been the story of the person in the title, Mickey and now Jam and how their interactions with the feuding gangsters and crooked police influences and changes their lives. All very clever stuff. This is going to be a very compelling series. (well I really hope that there will be more). I highly recommend both books. Awesome.